There is an interesting post at the American Enterprise Institute on the correlation of the percentage of children raised by their biological parents by state and the correlation with Republican or Democrat states. It has long been clear that college education results in a higher percentage of children being raised by their biological parents and a higher fraction of the population in the Democrat states has a college education. It has been clear that having Asian ethnic parents provides the highest parental presence, followed by white parents, Hispanic parents, and finally black parents. This study adjusted for the effects of college education and parental ethnicity to find that there was some residual positive correlation between Republican states and a greater percentage of children being raised by their biological parents. The reddest states, or those most consistently Republican, had the highest percentage of married adults. The question is this: Are people more likely to be married because they are Republican voters or they more likely to be Republican voters because they are married? It is most likely more correct to say that whether someone is married or not is a significant factor in how that person votes. We know that nearly 60% of self-identified Republicans are married and that two-thirds of unmarried women voted for Obama and Democrat Congressional candidates in the 2012 election (see here). A majority of married women voted for Romney in 2012 (53% to 46% for Obama). Overall, Romney won 56% of the married voter vote to Obama's 42%. So, it is clear that a voter's marriage status significantly influences the party for which a person votes. As a consequence, it is most likely more correct to say that a higher percentage of children are raised by their biological parents in Republican than in Democrat states because a higher percentage of adults are married in Republican states. One may question this by noting that since the number of people with college educations is higher in the Democrat or Blue states, then the fact that a college education correlates with a greater likelihood of parents raising their children together may offset the difference in marriage rates. This is where the adjusted data for education and ethnicity comes in. 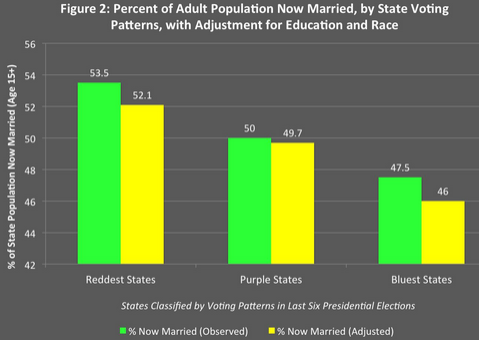 The yellow bars show that adjusted data and the adjusted marriage percentages for adults are still higher in the Red states than in the Blue states. It appears that marriage is more valued in the Republican states than it is in the Democrat states, consistent with the rhetoric of the respective parties. Marriage can most certainly be of great value to those in a marriage. It is a partnership that is much more loving and intimate than any other, with huge advantages in security and living efficiency as well. Some Republicans claim that this makes traditional marriage the cornerstone of society. In my evaluation, while traditional marriages are clearly extremely important, there is plenty of room for non-traditional marriage concepts to offer many of the same advantages to people who do not satisfy the limitations of the traditional marriage concept. The advantages of marriage are a right which should be available for everyone to claim with willing adult partners. This freedom will then make our society even stronger and better for the highly differentiated individuals of which it consists. Republicans, who often claim they favor more individual freedom, should embrace an enlarged concept of marriage to be consistent with both equal individual rights and their acknowledgement of the many values gained with marriage. Those values should not be limited to heterosexual couples. Everyone has a very broad freedom of association which they may exercise in their private sector choices, whether in a business context or in the context of a domestic partnership.